Although some people dislike the idea of ‘x-rays’ at the dentist, radiographs are one of the key diagnostic tools for determining someone’s overall oral health. This month’s blog will investigate the different types of radiographs that are taken, why they take them, and the importance of them for diagnosing oral disease. Generally, when patients first come to an office, a comprehensive set of radiographs is taken. Depending on the patient’s age and oral condition, that could consist of a Full Mouth Series (FMX) or Panoramic radiographs. A FMX series consists of about 18 radiographs that examines each tooth at different angles to search for the present of decay or periodontal disease. Panoramic radiographs give a more widespread view of the mouth, but sometimes do not give as detailed of a picture of individual tooth problems. 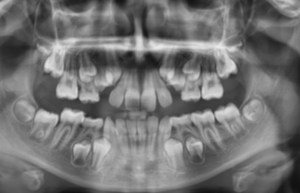 When patients are younger, generally a Panoramic radiograph can provide good imaging of erupting teeth and whether any are missing or impacted. Once these full sets are taken, they do not need to be retaken for about 5-7 years unless a patient has a new problem. Usually, they just have Bitewing radiographs updated every 12-24 months depending on the rate of tooth decay they get. Bitewings are a set of four radiographs that go straight through the teeth and are usually most useful when trying to diagnose cavities. Dentists can see the exterior enamel layer, inner dentin, and the pulp (nerve/blood vessel) of the teeth. Also usually the supporting bone level and existing fillings/crowns/implants can be viewed. Many patients have a sense of trepidation about taking dental radiographs. They are usually worried about the amount of radiation they may absorb. While this is a valid concern, sometimes people do not understand the exact amount of radiation they are experienced to every day. The below chart takes different dental radiographs and compares them to the amount of background radiation people receive from everyday life. ‘Background radiation’ comes from many sources – from food/water, occupational exposure, and even substances that are commonly found in homes. From the comparison – the amount of radiation from even a FMX or panoramic radiograph is equivalent of only several days of regular background radiation. If there is ever any concern about the radiographs being taken at the office, please feel free to speak to your dentist or hygienist about the reasoning behind them. Obviously excess exposure is never a good thing, but they can also be keys to diagnosing oral problems early on before they can worsen. Hopefully this served as an informative source for the types of dental radiographs and why they are necessary.